Base price includes shirt and crest only. What monograms do you want on your shirt? Customize a Greek button-down shirt for your sorority, business, club, or any organization. Maintain a classic, professional look. Perfect for the office and for business casual meetings. 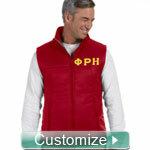 Fully customizable with your sorority symbols or crest. Monograms can also be added. 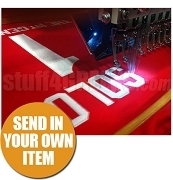 Use the form to customize your shirt. Just skip over any sections that you don't want to customize. If you aren't sure about something, just click the help (?) icons along the way.